You know them. Whether they met you in the hallways of the school and issued the term “nerd,” or made a fat joke at your expense, they were there. “They” were deemed bullies. Most liked to make as much fun of you as possible in order to get others to point and laugh. Maybe you were one of the strong ones who held your head high and made sure to only show your pain to the people you trusted—those parents at home who were there for you and wanted to do anything they could to help. Yet, no matter what they did, the bullies just seemed to get worse. For those lucky enough to read the first book in this series, The God Squad Mission Him-Possible: The Distorted Mirror, you were lucky enough to meet up with a group of kids who work together in order to help others. 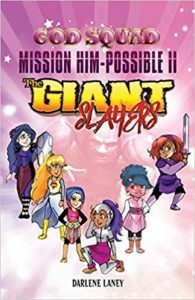 In the newest book, God Squad Mission Him-Possible II: The Giant Slayers, the kids are back, and the mission they are about to take on is a truly tough one. Angel is a member of The God Squad and the narrator of this tale. She brings readers along, telling them the story of a girl named Taylor Williams. Taylor is currently being bullied by Marcie. It wasn’t so long ago that Taylor was Marcie’s BFF. In fact, when Taylor first got to Carver Preparatory School, she became part of Marcie’s not-so-nice group and is guilty of doing the same type of bullying she’s receiving now. Let us just say that she and Marcie had a falling out, so Taylor is now the target of Marcie’s wrath. Taylor’s mom has tried to help. She has phoned the principal, she’s spoken with her pastor…everything. But the principal chalks it up to “girls being girls” and does not see the need to intervene. She believes that the girls will work it out. But as time moves forward, the bullying gets worse, even to the point where Taylor states that she would rather die than go back to school the next day. Ms. Foster is the head of The God Squad that includes Angel, Chris, Eve, Sadie, Mia, and Jade. She meets with the girls and shows them a picture of Taylor. The sad, doe-like eyes of the girl affect Angel in a hard way. You see, Angel has been bullied. She’s sickened by what’s happening to this poor girl because she still holds a bit of pain inside from when the teasing happened to her. She knows that if she hadn’t met the Squad when she did, she would’ve been in the exact same place Taylor is now…too scared and upset to talk to anybody about her predicament. Angel is assigned to be the team leader of this mission. By doing this, by helping Taylor, perhaps it will give Angel time to work through her own remaining demons and battle the giants that show up in her dreams; giants that make her feel small and alone. This book is fantastic, just like the first one in this series, The God Squad Mission Him-Possible: The Distorted Mirror. The God Squad is something I wish every school had. This teaches one and all that the Lord is there and is helping. You even meet some older women when you’re with Angel. Women who appear during times of great need (and disappear just as fast). The one thing I hope will stick with readers is a line that states: “God didn’t make junk when He made you.” I hope victims of bullies never forget those words, and I hope the bullies (“the giants”) who make people feel bad, come away knowing that there’s a mighty Giant Slayer in each one of us. These are not only fun reads with memorable characters, but these books also show how much easier life can be when you have faith in your heart, and true friends by your side. Quill says: This is perfect for many ages and is definitely a much-needed “must-read” for all.